This homemade costume for adults entered our 2012 Halloween Costume Contest. 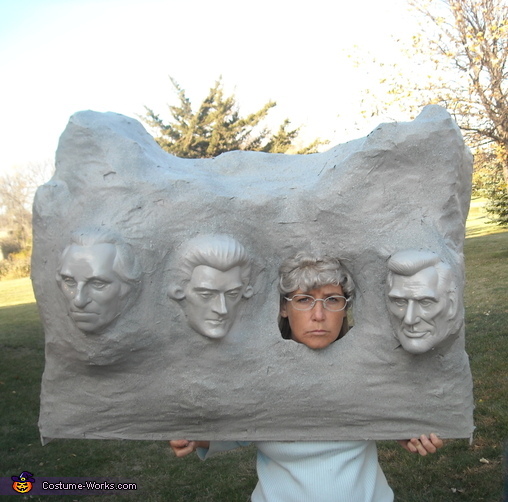 We took a family trip to Mt Rushmore in September and came home with a Mount Rushmore Costume idea! It took some time but was a lot of fun to make. It was constructed building a rectangle frame with upright supports from odds and ends of wood I had at home. I then used chicken wire to "mold" the mountain and attached with a staple gun. Cut a hole for your face. I bought the president's masks online at a costume supply site. They were taped into place. I then paper mached the whole structure and applied a second coat after it dried. This takes a lot of time! After it dries, I sprayed the whole costume with gray spray paint. I added another coat of textured paint to give a "rocky" look. I created shoulder straps using old pieces of fabric and again used the staple gun to attach. Last I draped on old sheet over the back, and sprayed it gray to cover the back. I wore gray face paint (black and white mixed) an old gray wig and glasses to represent Teddy Roosevelt. This costume took quite a bit of time but was lots of fun! I really want to buy that Mt R costume!! Where did you get the masks? We have been looking online, but having a hard time finding them. Thanks! Please share the costume store- would love to buy masks and can't find online. Thanks!